This is an extraordinary and little-known story of emigration from Scotland. Caithness and Patagonia are literally a world apart, yet in the late 19th and early 20th centuries a number of Caithness men and women took on the challenge of this wild, open and windswept land. The book provides the origins and backgrounds of these Caithness Patagonian pioneers and sets their experiences alongside the growth and development of Patagonia as one of the world’s great sheep farming areas. The story begins with John Hamilton, the son of a tailor from Wick, who arrived in the Falkland Islands in 1880. Over the following 60 years he and other Caithness men and women became a significant force in the development of sheep farming in Patagonia. As one of Patagonia’s most enterprising sheep farmers, he was the catalyst for a number of other Caithness men making what must have been a huge decision to uproot from their native home. It was not just Caithness men who embarked on the journey – sisters and wives followed as new lives were ground out of the unforgiving landscape. There are stories of endurance and determination against the odds; accounts of death and disaster, but most of all there are tales of how these Caithnessians conquered Patagonia and built successful businesses to the extent that today their descendants are integral to many aspects of Patagonian and Argentine society. The roll call of names – Bain, Barnetson, Begg, Bremner, Budge, Cormack, Harper, Mowat, Nicolson, Plowman, etc. – is like a Caithness directory. Their stories and legacies continue to be proudly held dear by descendants and relatives both in Caithness, the UK and in Argentina. The Caithness Patagonian story was originally brought to light by Margie Sinclair for the BBC Odyssey series. 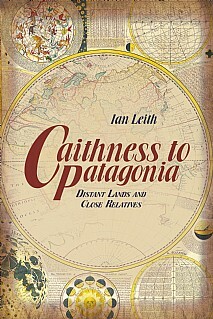 Caithness to Patagonia charts the backgrounds, the successes and failures of these intrepid pioneers who created a new life, far away from their homes and families. This will be of great interest to many people in Caithness or anyone with relatives in Patagonia, Argentina or Chile. It will also appeal to the wider Scottish diaspora and those with an interest in family history.